An IP address is how packets are routed to their destination across the Internet. Why is this important you ask? Well, imagine the Internet suddenly decided that you were living in the middle of Asia and all traffic that should go to you ends up traveling through a number of other countries to get to you, but you aren't there. You are still at home and haven't moved at all. All packets that should happily route to you now route elsewhere. Emails sent to you bounce as undeliverable, or are read by other people. Banking transactions fail. HTTPS handshakes get invalid certificate errors. This defeats the confidentiality, integrity, and availability of all applications running in the hijacked address spaces for the time that the hijack is running. In fact this sounds like a nifty way to attack an organization doesn't it? The question then would be how to pull it off, hijack someone else's address? The Autonomous System (AS) in question is owned by NedZone Internet BV in the Netherlands. This can be found by querying whois for the AS 25459. According to RIPE this AS originated 369 prefixes in the last 30 days, of these 310 had unusually small prefixes. 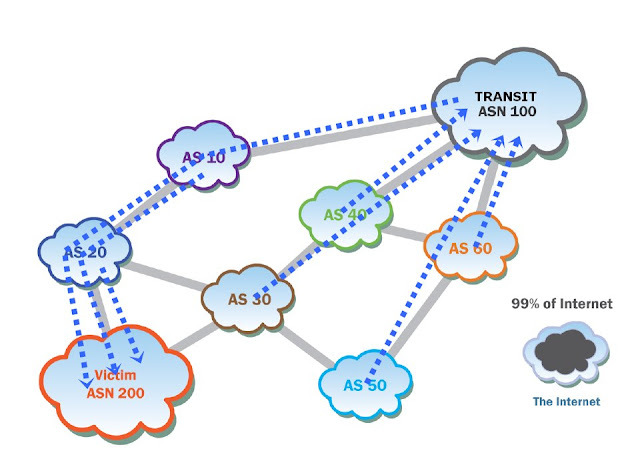 Typically a BGP advertisement is at least a /24 or 256 unique Internet addressable IPs. A large number of these were /32 or single IP addresses. The short answer is that any Internet Service Provider (ISP) that is part of the global Border Gateway Protocol (BGP) network can advertise a route to a prefix that it owns. It simply updates the routing tables to point to itself, and then the updates propagate throughout the Internet. If an ISP announces for a prefix it does not own, traffic may be routed to it, instead of to the owner. The more specific prefix, or the one with the shortest apparent route wins. That's all it takes to disrupt traffic to virtually anyone on the Internet, connectivity and willingness to announce a route that does not belong to you. This is not a new attack, it has happened numerous times in the past, both malicious attacks and accidental typos have been the cause. 1 AMAZON-AES - Amazon.com, Inc.
2 AS-7743 - JPMorgan Chase & Co.
Makes you wonder about the fundamental (in)security of this set of experimental protocols we use called the Internet doesn't it?